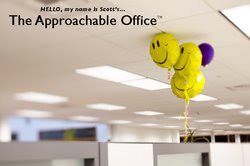 7 Effective Approaches for Handling The Office Criticizer without Using the Fire Extinguisher ~ HELLO, my name is Blog! 3. “What makes this so important to you?” This gem is especially effective when someone shoots down EVERY idea you suggest. It identifies a person's motives and challenges them to honesty examine their emotions, which, if they’ve lashed out at you, probably isn’t something they’ve done yet.